UNITED NATIONS, April 22 -- The public face of the UN has been melting down this month. Martin Nesirky in public, at the noon briefing which he runs, has taken to criticizing particular stories, to relegating disfavored journalists to the back of the question cue or seeking to limit question, even on topics like Thailand and Sudan. But that's only the public part. In a meeting with major wire journalists before the Bhutto Report press conference, Nesirky "melted down" in one participant's phrase and jabbed his finger at a reporter, saying you can't talk to me like that. Based on these descriptions, a new moniker has been suggested: Berserky. Nesirky, or Berserky, loudly claimed that Bhutto panel leader Munoz refused to provide his report before the press conference, but this turned out to not be true. There was anger, there was lash out, there was attempted rapprochement. But only to some. Even some of those favored by Nesirky have wondered at how little he fought the exclusion of his Office from Security Council consultations. Asked in a noon briefing by Inner City Press if there is any update, he said to ask the Council. But Japanese Ambassador Takasu on April 22 told Inner City Press this is mere housekeeping. It appears there is no update: Nesirky is out. Is that what has driven him Beserky? To some, to began early. 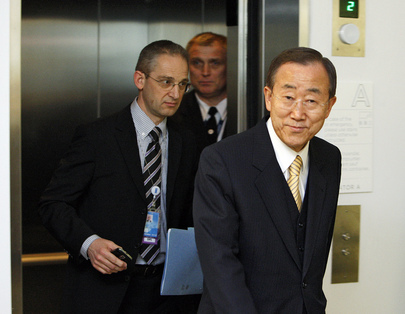 The moment he was named to the psot last year, some surmised without rancor that his knowledge of Ban Ki-moon's native tongue Korean had played a role in his selection. As they said on Seinfeld, nothing wrong with that. But Nesirky appeared at a noon briefing at which he took no questions, to deny that language played any role in his selection. This might have been a clue. Inner City Press for its part can point most recently to the April 21 briefing, when Nesirky descended to using his bully pulpit to unilaterally denounce a "blog" story -- he emphasized the word "blog" several times -- which characterized as a cover up the UN's stealth processing of evidence indicating UN Security officer Louis Maxwell was killed by the Afghan National forces. The next day, April 22, Nesirky relegated Inner City Press to the last question to UNRWA's John Ging, and sought to take no more questions from Inner City Press, including on Sudan, Thailand and Sri Lanka. There were other questions to be asked, but they will come in the future. With or without Beserky. Watch this site. Footnote: while Mr. Nesirky appears to doubt it, Inner City Press has no particular animus toward him. In person, he is pleasant. Some say he takes questions too personally. One hope this relationship can be saved.